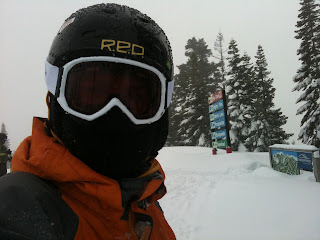 After an horrendous day of Delta Airlines travel on Friday, yesterday's first of three days of skiing made up for it. We went to Homewood, right near our house in Tahoe City, California. It's a great little resort with three lifts and not many people, and it's known as a place for locals rather than tourists. Normally there are great views of Lake Tahoe, but not with all this snow swirling around. At one point, the wind actually pushed me backwards on my skis for several feet. Jackson slept in the car for the first two hours, so it was easier for Rachel and I to swap off taking turns up the mountain with a happy little boy playing in the snow at the bottom. All this snow is making skiing phenomenal. The trip out, as I mentioned, was another story. We had a one-hour layover in a busy Salt Lake City airport that turned into six hours because the toilet broke on our second plane, and an additional hour after they decided to de-ice the plane after we taxied out to the tarmac. By now, of course, I was missing all of the North Carolina Sweet 16 game against Marquette. Finally, we arrived at our rental house and there were a bunch of ladies drinking Bud Light and watching TV. They had it rented for three months. So the rental person came and met us and took us to a different property of hers. It's OK and will do.